After upgrading to Ubuntu 17.10 (and switching to the vanilla GNOME desktop, but I'm not sure if that's relevant), left-click select-to-copy and middle-click-to-paste no longer works. I found this documentation page which suggests the change is deliberate, but can't see instructions anywhere on how to change it back. You may use the indispensable (GNOME) Tweaks to achieve your goal. 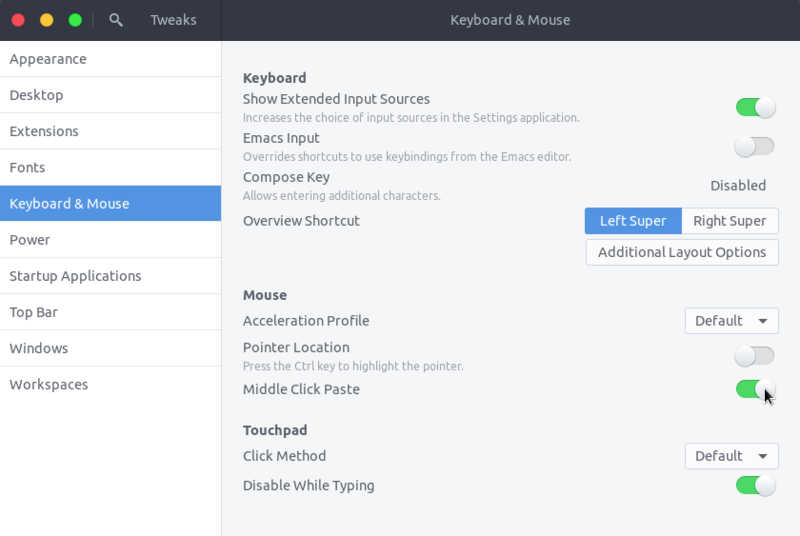 Then launch Tweaks and go to Keyboard & Mouse section and toggle on the "Middle Click Paste" option. In Ubuntu 17.10 running Wayland as well as Xorg, left-click select-to-copy and middle-click-to-paste both work for me (like in previous versions). I have a fresh installation. I would guess that some setting from the previous version is causing your problem. Many fundamental things have changed in 17.10, so I think it is better to make a fresh installation. It is often easiest and fastest to make a fresh installation instead of upgrading from a previous version. Install the additional program packages that you remember (that you need). Copy back your personal files from the backup. It helps if you use a separate data partition for your personal data. Later on, when you need another program package, install it. This way you will get rid of old program packages, that you will not use. Not the answer you're looking for? Browse other questions tagged gnome mouse clipboard or ask your own question.